MIT postdoc, Grace Han, handles a new chemical composite that could provide an alternative to fuel by functioning as a kind of thermal battery. Photo: Melanie Gonick/MIT. In large parts of the developing world, people receive abundant heat from the sun during the day, but most cooking takes place later in the evening when the sun is down, using fuel – such as wood, brush or dung – that is collected with significant time and effort. Now, a new chemical composite developed by researchers at Massachusetts Institute of Technology (MIT) could provide an alternative. It could be used to store heat from the sun or any other source during the day, acting as a kind of thermal battery, and it could then release the heat when needed, for example for cooking or heating after dark. A common approach to thermal storage is to use what is known as a phase change material (PCM), where input heat melts the material and this phase change – from solid to liquid – stores energy. When the PCM is cooled back down below its melting point, it turns back into a solid, at which point the stored energy is released as heat. There are many examples of these materials, including waxes or fatty acids used for low-temperature applications and molten salts used at high temperatures. But all current PCMs require a great deal of insulation, and they pass through the phase change temperature uncontrollably, losing their stored heat relatively rapidly. Instead, the new system uses molecular switches that change shape in response to light. When integrated into the PCM, the phase-change temperature of the hybrid material can be adjusted with light, allowing the thermal energy of the phase change to be maintained even well below the melting point of the original material. The new findings, by MIT postdocs Grace Han and Huashan Li and MIT professor Jeffrey Grossman, are reported in a paper in Nature Communications. "The trouble with thermal energy is, it's hard to hold onto it," Grossman explains. So his team developed what are essentially add-ons for traditional phase change materials, or "little molecules that undergo a structural change when light shines on them". The trick was to find a way to integrate these molecules with conventional PCM materials to release the stored energy as heat, on demand. "There are so many applications where it would be useful to store thermal energy in a way lets you trigger it when needed," he says. The researchers accomplished this by combining fatty acids with an organic compound that responds to a pulse of light. With this arrangement, the light-sensitive component alters the thermal properties of the other component, which stores and releases energy. The hybrid material melts when heated, and after being exposed to ultraviolet light, it stays melted even when cooled back down. Next, when triggered by another pulse of light, the material re-solidifies and gives back the thermal phase-change energy. "By integrating a light-activated molecule into the traditional picture of latent heat, we add a new kind of control knob for properties such as melting, solidification and supercooling," says Grossman, who is professor in environmental systems as well as professor of materials science and engineering. The system could make use of any source of heat, not just solar, Han says. "The availability of waste heat is widespread, from industrial processes, to solar heat, and even the heat coming out of vehicles, and it's usually just wasted." Harnessing some of that waste could provide a way of recycling the heat for useful applications. "What we are doing technically," Han explains, "is installing a new energy barrier, so the stored heat cannot be released immediately." In its chemically stored form, the energy can remain for long periods until the optical trigger is activated. In their initial small-scale lab versions, they showed the stored heat can remain stable for at least 10 hours, whereas a device of similar size storing heat directly would dissipate it within a few minutes. And "there's no fundamental reason why it can't be tuned to go higher," Han says. In the initial proof-of-concept system, "the temperature change or supercooling that we achieve for this thermal storage material can be up to 10°C (18°F), and we hope we can go higher," Grossman says. Already, in this version, "the energy density is quite significant, even though we're using a conventional phase-change material," Han says. 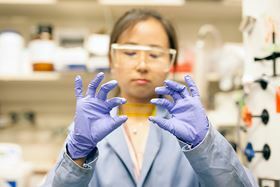 The material can store about 200 joules per gram, which she says is "very good for any organic phase-change material". And already, "people have shown interest in using this for cooking in rural India," she says. Such systems could also be used for drying agricultural crops or for space heating. "Our interest in this work was to show a proof of concept," Grossman says, "but we believe there is a lot of potential for using light-activated materials to hijack the thermal storage properties of phase change materials."